Preface. Fundamentals and Sorption of Micropores. Membrane characterization by combination of static and dynamic techniques (Th.A. Steriotis et al.). In situ X-ray diffract ion studies on micropore filling (T. Iiyama et al.). Neutron and ion beam scattering techniques (J.D.F. Ramsay). Application of pulsed field gradient NMR to characterize the transport properties of microporous membranes (W. Heink et al.). Diffusion studies using quasi-elastic neutron scattering (H. Jobic). Frequency response methods for the characterization of microporous solids (L.V.C. Rees, L. Song). Measurement of diffusion in porous solids by Zero Length Column (ZLC) methods (D.M. Ruthven, S. Brandani). Characterization of microporous materials by adsorption microcalorimetry (P. Lllewellyn). Modeling of Sorption and Diffusion in Microporous Membranes. Simulation of adsorption in micropores (D. Nicholson, T. Stubos). Molecular simulation of transport in a single micropore (D. Nicholson, K. Travis). Simulation of gas transport in a 'network of micropores'. The effect of pore structure on transport properties (E.S. Kikkinides et al.). Recent Advances in Microporous Membrane Preparation. Microporous carbon membranes (S. Morooka et al.). Microporous silica membranes (N. Benes et al.). Zeolite membranes (J.D.F. Ramsay, S. Kallus). Chemical vapour deposition membranes (M. Tsapatsis et al.). Composite ceramic membranes from Langmuir-Blodgett and Self-Assembly precursors (K. Beltsios et al.). Nanophase ceramic ion transport membranes for oxygen separation and gas stream enrichment (C.G. Guizard, A.C. Julbe). Gas Separation Applications. Nanoporous carbon membranes for gas separation (S. Sircar, M.B. Rao). Microporous inorganic and polymeric membranes as catalytic reactors and membrane contactors (E. Drioli, A. Criscuoli). This book is dedicated to the rapidly growing field of microporous ceramic membranes with separating layers of pore diameter less than 2nm. 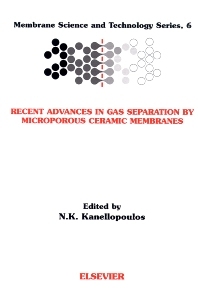 The chapters of this book bring forward a wide range of issues, namely fundamentals of complex sorption and transport processes in micropore structures, highly innovative methods of preparation of microporous membranes and examples of their possible commercial applications. This book presents insights by distinguished investigators, who have contributed significantly to the advance of research efforts in the diverse topics described herein. Recently, significant progress has been made with respect to the development of novel microporous asymmetric membranes, mainly involving modification by means of deposition of additional material within the pores of the substrates. Most state-of-the-art technologies aiming in the development of microporous ceramic membrane are presented in the third section of the book. These include several material deposition methods and techniques on macroporous or mesoporous supports and substrates from the liquid or vapour phase, namely those involving sol-gel, zeolite and chemical vapour deposition techniques. In addition to the above-mentioned methods, the classical technique of carbonizing polymeric deposits along with one of the novel techniques of plasma-treating, organically deposited Langmuir-Blodgett films, are also presented. Nanophase mixed ionic-electron membranes for enhanced oxygen transport are described, which pose a strong candidacy for a number of significant commercial applications. For scientists and researchers interested in the field of membrane technologies, as well as those interested in the applications of these technologies.